© 2010 FarmgirlFare.com, the tenderfooted foodie farm blog where Big Sweet Teddy, another one of my, ahem, 'useless' pet wethers has been in quarantine due to an unfortunate and tenacious case of foot rot. 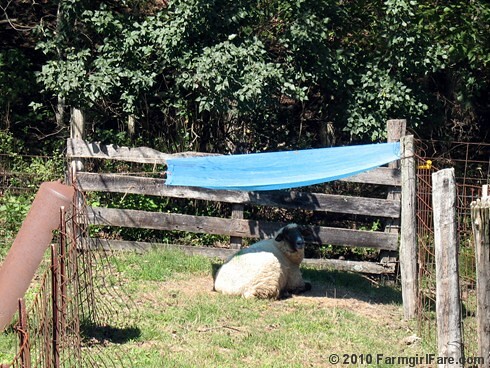 He may be living apart from his flock (he can still see them), but with plenty of daily treats, a nice dry hut to call his own, and a specially made personal shade device (compliments of my handy hunky farmguy), he definitely isn't suffering much. In fact, some days I wonder if he's even trying to get better. Foot rots sounds awful. However, sick bay looks pretty comfy! You might be right...who needs to get better when you have a private room complete with shade?! A sick pen is always a good thing to have on a farm. I had a particularly tenacious strain of foot rot in my sheep. I got rid of it by putting dry zinc sulfate powder in the foot bath, and making them walk through it to get to their water. Because I live on the coast range of Oregon, it's usually muddy, and the stuff stuck to their feet. Haven't had any problems since! We owe our useless wethers special attention - having taken away their main purpose in life! If I get foot rot - can I come and y'all take such good care of me??? Hope you are having beautiful days and nights - gorgeous weather here. We have our little shade tents too! Get well soon Teddy. Clearly he deserves pampering, a sheep as handsome as he is!